Could you quit meat once a week for a year? A lot of us just can’t imagine a meal without a hunk of meat on the plate. But with the right recipes, you can simply swap beef, pork or chicken with a veggie-based protein and enjoy a vegetarian meal without even missing the meat. So, why bother? Here’s why: even if you skip meat just once or twice a week, it’s better for your health and the environment. Beans are the perfect “gateway” food when you’re going meat-free. First of all, they’re convenient and cheap. You can buy a can (a whole pound!) of cooked beans for just a couple of dollars. Use them to replace meat in everything from tacos to chilli to pasta. Not only are beans delicious, they’re nutrient powerhouses. On average, just 1/2 cup of beans provides about 7 grams of protein and up to 7 grams of fiber. 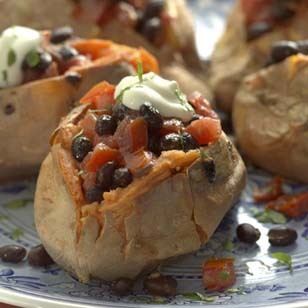 I love topping baked sweet potatoes with spiced up black beans for a quick and satisfying dinner. Tofu is growing in popularity among vegetarians and meat-eaters alike—and for good reason. (Tofu-phobic? This Tofu Parmigiana will change your mind!) Tofu, a great source of soy protein, also boasts significant calcium and magnesium. Plus it’s super-versatile. Extra-firm tofu is ideal for stir-fries, sautés and grilling, while the soft variety makes a good substitute for ricotta in Italian dishes or for eggs in quiches. Tofu is available at natural-foods stores and most large supermarkets. Crumbled tofu makes a great meat-free lasagna filling—you can’t even tell it’s there hiding under all the yummy sauce and cheese. If you’re keen to explore vegetarian options, try protein-rich tempeh. Tempeh is a chewy, nutty, fermented soybean loaf. Find it (plain or with added grains) near refrigerated tofu in natural-foods stores and many large supermarkets. We particularly like SoyBoy 5 Grain and Lightlife Flax tempeh. After opening, wrap and refrigerate for up to 5 days. I love tempeh smothered with meaty mushrooms and provolone cheese. Seitan’s toothsome texture and taste make it a perfect vegetarian stir-fry ingredient that even non vegetarians will love. Seitan is processed wheat gluten that is high in protein and has a meaty texture. You can find it in natural-foods stores or large supermarkets near the tofu. The actual weight of the seitan in a package varies depending on whether water weight is included. Look for the “drained weight” on the label. I like to add bite-size pieces of seitan to my veggie stir-fries, then toss with a rich sauce to pull all of the flavors together.